MoldovaStamps.org is a website owned and operated by IMPS. The website is operated on a non-commercial and non-profit-making basis. MoldovaStamps.org exists purely as an information service for the world-wide community of Moldovan Philatelists and for the promotion of Moldovan Philately in general. IMPS (MoldovaStamps.org) does not trade (buy, sell, exchange or swap) any physical materials or services. IMPS (MoldovaStamps.org) does not have any commercial agreements with any stamp dealers. IMPS (MoldovaStamps.org) does not sell any advertising or earn any referral fees or other sales commission from any commercial organisation what-so-ever. IMPS (MoldovaStamps.org) is happy to place adverts and references to stamp dealer's websites and the websites of other stamp-related organisations, on a no-fee basis and entirely at the Editor's discretion. This is only done in cases where the external organisation has been helpful in providing MoldovaStamps.org with useful philatelic information and/or where the Editor feels that the link might be useful or interesting to MoldovaStamps.org website visitors in general. As of the time of writing this, IMPS (MoldovaStamps.org) has no formal relationships of any kind with any of the state bodies of the Republic of Moldova. No commercial agreements are in place and there is only informal communication between MoldovaStamps.org and the Moldovan Post Office "Posta Moldovei". However, formal technical co-operation between IMPS (MoldovaStamps.org) and Posta Moldovei is certainly desirable and if any such agreement is ever reached, this information will be announced here. 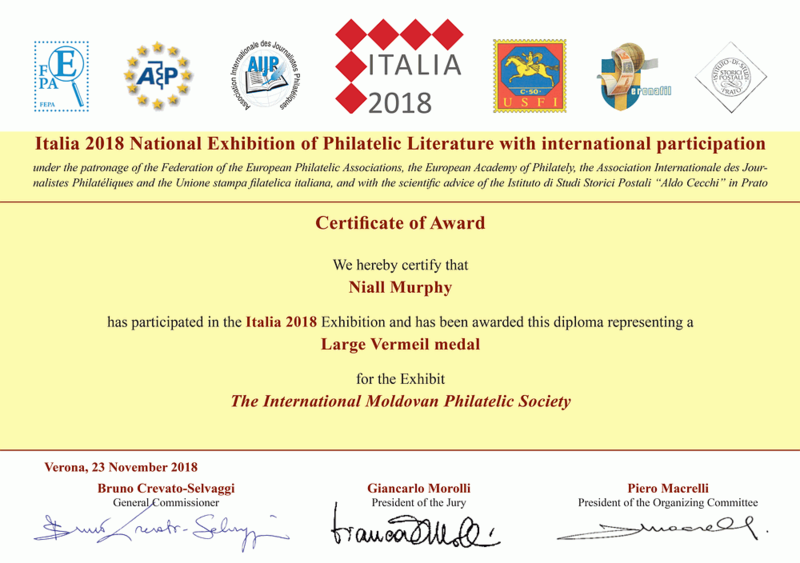 As of the time of writing this, IMPS (MoldovaStamps.org) has absolutely no relationships of any kind with any international philatelic organisations. You can read all the IMPS (MoldovaStamps.org) legal policies and terms & conditions of the use of this website here. The prices displayed throughout the catalogues represent our valuations of full, retail prices and are calculated, based on a number of sources and factors, including; rarity, demand, face value, amongst others. Collectors should consider all prices to be guidelines and should take note that stamp dealers will often offer substantial discounts off these prices. The prices in the catalogues can be used for the purposes of insurance valuation and represent our estimates of the full, retail, replacement costs. All prices are subject to periodic review and to change, without prior notice. Under no circumstances can MoldovaStamps.org be held liable for any losses incurred by any third party, as a consequence of our published prices. Unlike other, commercially-available stamp catalogue publishers and contrary to the policies of certain international philatelic organisations, IMPS (MoldovaStamps.org) has a policy to list and illustrate all fake and forged philatelic materials and to clearly classify such material accordingly. MoldovaStamps.org believes that this is the best way inform collectors about the true nature of materials they may locate from various sources, rather than simply omitting the details and leaving the collectors uninformed. IMPS (MoldovaStamps.org) is fully supportive of all efforts to eliminate fake, forged and bogus philatelic materials and believes that a "naming and shaming" policy is an effective method of achieving this. In Moldova, it is possible to go to a post office and present an envelope or postcard bearing any Moldovan stamp and to have it postmarked with the official First Day Cancellation or other special cancellations, if available, thus permitting the creation of private First Day Covers and Maximum Cards. Since these items are completely legitimate, this catalogue will attempt to list all known examples of them, provided that the envelope or postcard is not an unauthorized reproduction of the official design, attempting to mislead collectors into believing that the item is an official issue of the Moldovan Post Office. In cases where the FDC envelope designs are unauthorized reproductions of the official FDC envelopes, which are protected by copyright law, IMPS (MoldovaStamps.org) will classify the FDC as a fake. Such items will be listed and illustrated for information purposes only and to inform collectors that they should not be misled into believing that these are official issues. Modern postage stamp production practices can often cause confusion regarding the classifications of certain sheets as "Blocks" or "Minisheets". Even commercial catalogue publishers such as Michel do not seem to apply consistent rules when making the determinations. Since MoldovaStamps.org attempts to follow the Michel system as closely as possible, we generally defer to their classifications decisions. Nominally a "Block" is defined as "a sheet containing more or more different stamps and/or labels". Nominally a "minisheet" is defined as "a sheet containing multiple examples of the same stamp". Full details of the MoldovaStamps.org catalogue numbering system can be found here.